This house has a really nifty floor surface downstairs. Like many houses up here on the mountain, our house is built on a foundation of bricks laid out over a sand base. The bricks make an attractive floor, absorb some warmth from the air, and are easy to take care of. To start at the beginning of this adventure, we have to flashback to November, not too long after we'd moved in. Since her office is upstairs, Yvonne works at home much of the day. She began hearing scuffling, scratching noises emanating from the bathtub. She would make noise and pound on the tub, and sometimes the noise would stop for awhile. This went on for a couple of weeks, but eventually the noise abated and she forgot all about it. Time passed; we got settled in. In January, we noticed that a single brick, precisely in the middle of the hall, was a little lower than the surrounding bricks. Not a big deal - the brick floor isn't perfectly level. But this one brick was sinking slowly, continuing to drop. Eventually other bricks around it began to join it in its plunge. Something would have to be done. It's not easy to extract one brick from a good, solid brick floor! But finally the center brick sunk low enough that an adjoining brick could be removed. 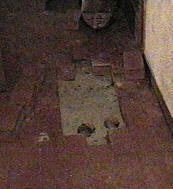 An area about two feet square was uncovered, and there, underneath, was a channel into which the bricks were sinking. This was bad! Perhaps water was leaking from somewhere and washing away the sand? But no, this channel is quite dry. More bricks were removed and a flashlight brought to bear on the depths of the hole. What do we see at the end but a cosy little nest lined with insulation (pilfered from our attic, no doubt!). And asleep in the nest, a squirrel! "Hmmmm," we said. Now what? This must have been the source of all that scratching back in November. This industrious little beast has tunnelled from the side of our house all the way through the bathroom and into the hall (about 20 feet). If allowed to stay, he'll no doubt tunnel further - causing more bricks to sink - and possibly even (horrors!) try raising a family under there in the spring. But what do we do with him? "Trap him and turn him loose somewhere else," say Philip's co-workers. It's January, we explain; he'll freeze. "Feed him until spring," they say. Right, we reply, eyeing the brochures about hantavirus and plague being carried by rodents in New Mexico. We're animal lovers and we don't have anything against squirrels, so we put a board over the large hole in the hall and ponder the problem for awhile. Eventually, though, we come to the sad conclusion: Burrowing under our house was not a wise survival decision. Our uninvited guest will have to be removed from the gene pool before we remove him from under our floor. At last, after much pounding and cussing, the floor is "Good night, sleep tight," we sing, as Philip sprays a can of Rapid-Start into the burrow. The ether should make our guest's end as peaceful as possible. That unpleasant task over with, the only problem is how to extricate the remains without further dismantling the floor. Then there's the process of pounding 200 pounds of sand into the burrow to replace what was removed by the nest-builder. And the bricks have to be wedged back in somehow; it's a lot like putting a jigsaw puzzle together. That brick won't fit there, but maybe this one will! more or less restored to normal, now unoccupied. There will be one less squirrel frolicking in our woods this spring, and we'll never again ignore noises coming from underneath the tub!